First order of business, as many of you had guessed, the Kingsford Hickory Infused Propane announcement was an April Fools prank. You just can't replace the flavor that charcoal grilling adds to food, "specially designed infuser plate" or not. I kind of feel bad about pulling your leg. 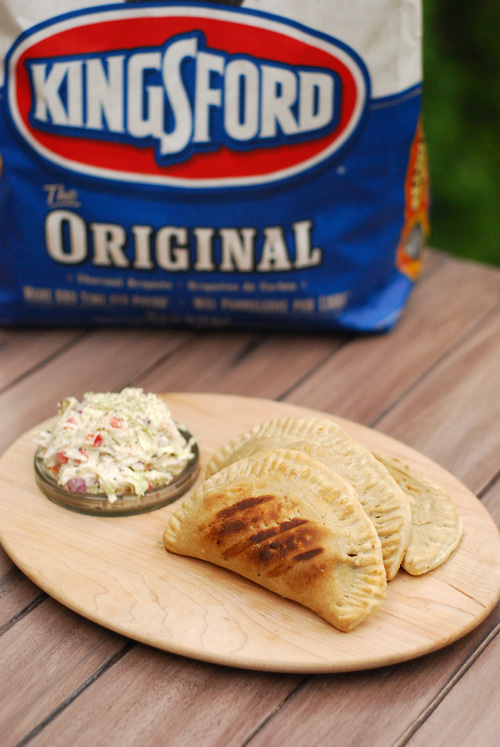 To make it up to you, here is a recipe created by world champion pitmaster, Chris Lilly, on behalf of Kingsford Charcoal. It was a perfect way to use up some of the leftover pulled pork in the freezer. My notes are at the end. Pitmaster Note: In the South, barbecued pork could be its own food group. 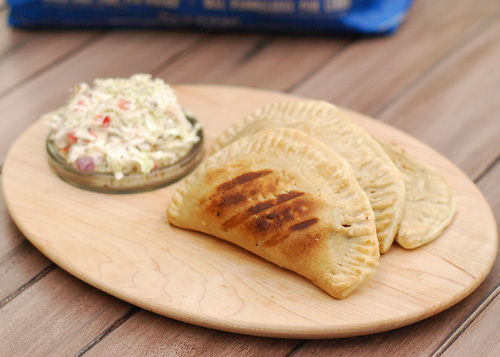 This recipe takes a modern spin on the most popular barbecue cuisine, by filling a crisp pie pocket with barbecued pork, grilling over hot charcoal and topping it with a creamy creole coleslaw. Cut butter into 1/2 inch cubes and refrigerate. Measure the water and refrigerate. In a small mixing bowl add flour and salt and mix well. Add in the cold butter until the mixture resembles coarse bread crumbs. Slowly add water, mixing continuously, until a dough ball is formed. 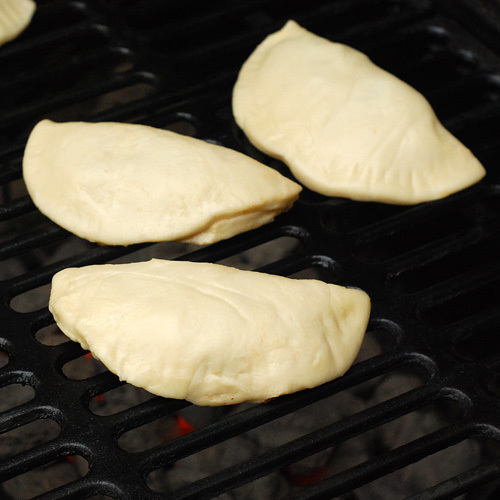 Seal the dough ball in GLAD® Cling Wrap and place in the refrigerator overnight. Sprinkle countertop or cutting board generously with flour. Remove dough from the refrigerator and place onto the floured prep area, roll out to a thickness of 1/8 inch. Cut the dough into five to six inch diameter circles. Removing extra dough from the prep area to re-roll and make more pie shells. Immediately peal, lift and flip the dough circles making sure they don’t stick. Yield should be eight pie shells. In a small sauce pan combine the soaking sauce ingredients and stir well. Bring the sauce to a light boil, reduce the heat and simmer for 20 minutes. Remove the sauce from the heat and set aside. Combine the chopped pork and 1/2 cup of soaking sauce (reserve the remaining sauce) in a medium bowl and mix well letting the pork soak-up the sauce. 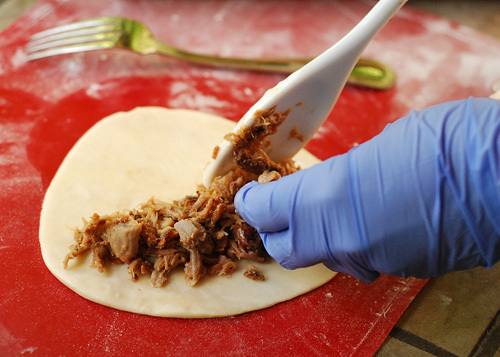 Spread three tablespoons of sauced pork onto one-half of each dough circle, but make sure the outer edge of the shell is uncovered. Lightly moisten the edges of the dough with water. Fold the dough in half creating a half moon with filling. 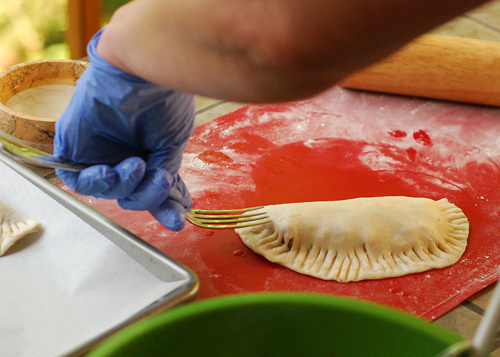 Gently press the pie edges together and crimp them with a fork. To create the creamy creole coleslaw, combine the cabbage, tomato, onion, bell pepper, celery and sugar in a large bowl and mix well, until the sugar dissolves. In a separate bowl combine the dressing ingredients and mix. Pour the dressing over cabbage mixture and stir together. Chill until ready to serve. Prep the charcoal grill grate with a grill brush and a light coat of oil. 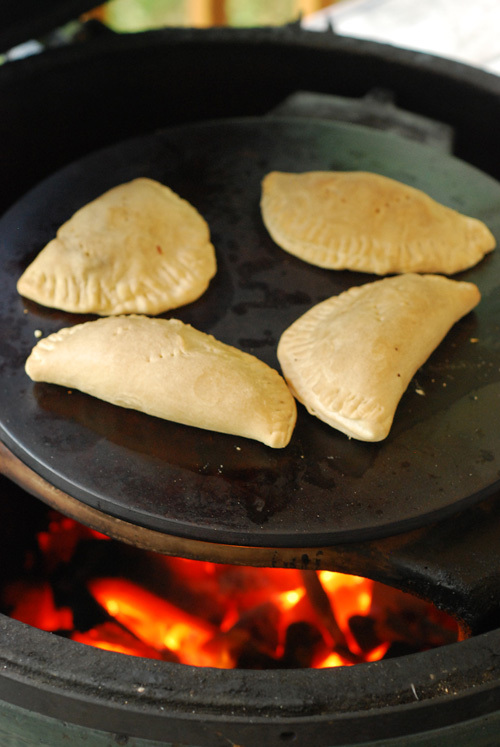 Transfer the pies to the grill and cook at 400 degrees Fahrenheit over direct heat for two to three minutes on each side, or until the dough turns a crispy golden brown. (Note: Do not use the grill lid when grilling the pies.) 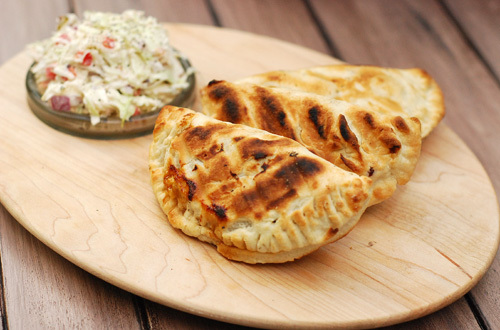 Remove from the grill and serve topped with creamy creole coleslaw and drizzle with remaining soaking sauce. I completely messed up the first time I made these and the outside of the dough was burned before the inside was done cooking. I made two mistakes to cause this. I had the coal tray raised rather high on the Smoke Hollow charcoal grill, there needed to be more distance. I also closed the grill lid instead of leaving it open like they recommended. Color my face red. So the second time I made two batches. One batch I cooked on my Smoke Hollow grill with the charcoal tray lowered all the way down giving maximum distance between the coal and grill grates. The second batch I cooked indirect at 350f on my Big Green Egg (platesetter legs down, spacers, then a pizza stone). Both worked this time. Spreading the chopped pork mixture. The indirect ones had a smoother texture. I put them on the direct grill just for a minute for the marks. The direct grilled had a more rustic appearance but the dough was crispier.